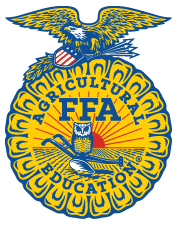 FFA is an intracurricular student organization for those interested in agriculture and leadership. It is one of the three components of agricultural education. What do the letters FFA stand for? The official name of the organization is the National FFA Organization. The letters “FFA” stand for Future Farmers of America. These letters are a part of our history and our heritage that will never change. But FFA is not just for students who want to be production farmers; FFA also welcomes members who aspire to careers as teachers, doctors, scientists, business owners and more. For this reason, the name of the organization was updated in 1988 after a vote of national convention delegates to reflect the growing diversity and new opportunities in the industry of agriculture. Today, the National FFA Organization remains committed to the individual student, providing a path to achievement in premier leadership, personal growth and career success through agricultural education. FFA continues to help the next generation rise up to meet those challenges by helping its members to develop their own unique talents and explore their interests in a broad range of agricultural career pathways. So today, we are still the Future Farmers of America. But, we are the Future Biologists, Future Chemists, Future Veterinarians, Future Engineers and Future Entrepreneurs of America, too. Develop my potential for premier leadership, personal growth and career success. Make a positive difference in the lives of others. Dress neatly and appropriately for the occasion. Respect the rights of others and their property. Be courteous, honest and fair with others. Communicate in an appropriate, purposeful and positive manner. Demonstrate good sportsmanship by being modest in winning and generous in defeat. Make myself aware of FFA programs and activities and be an active participant. Conduct and value a supervised agricultural experience program. Strive to establish and enhance my skills through agricultural education in order to enter a successful career. Appreciate and promote diversity in our organization. Adopted by the Delegates at the 1952 National FFA Convention. Revised by the Delegates at the 1995 National FFA Convention.